You should expect production rates of about 10 bottles per minute (600 per hour), starting out and to reach over 25 per minute (1500 per hour) with experience. Less labor, Less cost per bottle. Fill hundreds of bottles day with one person! Less labor and time means less cost per bottle-Equals More Profit! This will handle anything from Essential Oils/Fragrance Oils to very thick lotions and creams. For the Food Industry, it will handle hot jams, thick chunky salsas and sauces. Contact us for additional information. Manually or semi-automatically operated. 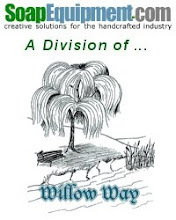 Willow Way Easy Fill Bottler is used in many applications in the cosmetic, personal care and food industries. 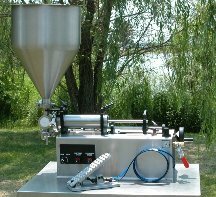 Can be supplied with additional interchangeable cylinder and piston assemblies to fill from fractional ounces to one gallon with a single machine cycle.